1.25 Slip Tee Floor Model & Extension Replacement Part  - $4.60 : Yarn Tree, Your wholesale source for cross stitch supplies. Iem 0822. 1¼" Slip Tee. Replacement part for the Q-Snap Floor Model and Floor Model Extension. Be sure this is the correct part as it is very similar to Item 0823. 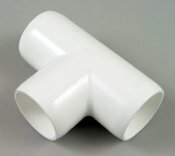 This is a Slip Tee and will allow a tube to pass completely through (there is no ridge inside to stop the tube).